As the owner of the guitar brand Rock N Roll Relics, founding Jetboy guitarist Billy Rowe is better known these days for building axes for the likes of Green Day’s Billie Joe Armstrong, Gilby Clarke, Bruce Kulick, Glen Campbell and R.E.M.’s Peter Buck. 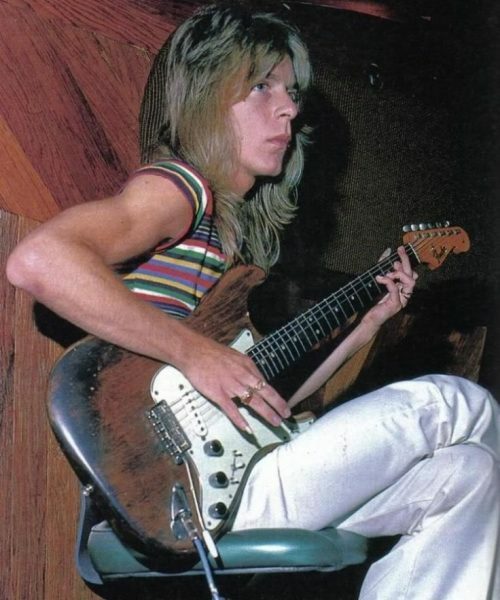 Always ready to tackle anything guitar-related, Rowe was more recently approached to do a project that would include shedding some light on the mysterious brown Fender Stratocaster Randy Rhoads is pictured with in some historic photos from his Quiet Riot days. Considering the project was proposed by no less than Rhoads’ very first guitar tech/roadie, Harold Friedman, Rowe had no choice but to jump at the offer. To help tell the story, Rowe called on his old friend and fellow guitarist Tracii Guns of L.A. Guns fame. “Tracii and I go way back and I know he’s a huge Randy Rhoads fan, so he’s the first person I thought of to do the video with Harold,” Rowe said. This project will lead up to a limited run of 25 replica guitars built by Rock N Roll Relics in memory of Randy. “I approached Rock N Roll Relics after searching for a boutique guitar manufacturer that I thought could do justice to this project,” Friedman said. The project will also donate a portion of the money toward helping kids buy instruments who otherwise couldn’t afford them. “Inspiring kids, or anyone for that matter, to be able to play music is something Randy would have done on his own if he was still with us,” Friedman said. Part One of this intimately unique story about one of rock’s greatest guitarist and the mystery surrounding the brown Stratocaster is below. Enjoy and stay tuned. Learn more about Billy Rowe and Rock N Roll Relics.